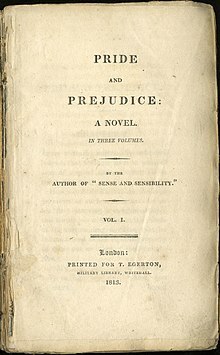 Pride an Prejudice is a novelle o manners bi Jane Austen, first published in 1813. The story follaes the main character, Elizabeth Bennet, as she deals wi issues o manners, upbringin, morality, eddication, an mairiage in the society of the landed gentry o the Breetish Regency. This page wis last eeditit on 18 Dizember 2015, at 21:21.